I saw lots and lots of pictures, read up on lots and lots of recipes, but I still can’t make it right(frustrations!!). Some recipe bloggers said it was pretty easy and the results are guaranteed everytime, but not for me– the cake sometimes turns out slightly better, but other times not! 😦 I think there will be at least a few more trials until I get it right (golden crust that’s not sticky, tall and not shrink horribly, moist and very fine cake crumb)– I believe I did the batter correctly– my problem might be the oven (temperature and/or moisture), which is more challenging than mixing the batter… sigh. I finally got that nicely browned top crust that I always look for in a Japanese cheesecake, and the crust doesn’t get sticky after cooling. But the cake top cracked pretty bad, which indicates oven temperature is too high, and possibly not enough steam in the oven (found out, after baking, that water dried out during baking! )–> next trial, use 350°F/325°F or even 325 all the way, and more water. I removed cake from the oven right after baking, cool for a few minutes then remove the spring-form side (I was afraid moisture will trap and make the cake wet). At first the cake was tall and handsome, but it started to shrink in no time, HORRIBLY! !–> next trial, turn off oven after baking, take out water tray (to avoid extra steam in the oven which may cause the cake too moist), and let the cake stay in the oven for at least 20 minutes with oven door ajar opened. Very light, and mild cream cheese taste even though I used original full fat version. Lemon flavor is too subtle for me–> next trial, increase lemon juice to 4 tbsp. Very fine cake crumb and moist, but not wet like bread pudding. Fill a shallow pan with tap water to half way, place the water pan at the lowest rack in the oven. Place another oven rack at the second lowest level, this is where the cake bakes. Preheat oven to 375°F. Grease, and lined the bottom and side of a spring-form cake pan with parchment paper, leaving 2 inches higher than the rim of the cake pan. Melt cream cheese and butter in a big bowl over double boiler (alternatively can be done in microwave), add milk and salt and hand whisk with a balloon whisk until smooth. Cool slightly if the mixture is too warm. Whisk in egg yolks and whole egg, one at at time, and blend well after each addition. Add in lemon zest and lemon juice, whisk to blend very well. Sift cake flour to the yolk mixture in 3-4 batches, whisk to blend really well before next batch and no visible small lumps. Whip egg whites on high speed (KA stand mixer speed 8) until tiny bubbles form and no visible clear egg whites, add cream of tartar and continue on high speed (speed 8). Scrap down the bowl if necessary. When the egg whites turn white and the bubbles becomes more fine, slowly add in sugar. Continue whipping on high speed (speed 8) for a few minutes. Scrap down the bowl at least once. When the egg whites has a sheen look like pearl, turn to low speed (speed 4) for a few more minutes to push out big air bubbles. Whip until its is soft peak (curly tip on the whisk when lifted upside down). Gently fold in whipped egg whites to yolk mixture in 3-4 batches until all blended well and no egg white lumps. Slowly pour batter to the cake pan (this will avoid big bubbles and last check for any egg white lumps, you can also sift batter through a strainer to cake pan). Tap cake pan a couple of times on a surface. Then place cake pan inside a larger baking pan (to catch any spills if it happens during baking). Bake at 375°F for 10 minutes, then reduce temperature to 325°F for 50 minutes. Remove from oven and cool on a rack slightly before unmolding. Oven temperature: next trial, use 350°F/325°F or even 325 all the way. Water tray: next trial, use a deeper/wider tray for more water. Lemon Juice: next trial, increase to 4 tbsp. Cooling cake: next trial, cool cheesecake in the oven (with temperature off and water tray removed) for at least 20 minutes. Then cool completely before unmolding. I subscribe to a group on Facebook called “Baking Wonderland”, and recently I saw lots of mouth watering yummy looking Ogura cake photos posted to Baking Wonderland, all kinds of flavors too– vanilla, pandan, chocolate, coffee, mocha, mocha, passion fruit, pomelo honey etc… This is how I get to know Ogura cake. “Ogura” sounds like Japanese so i believe it’s a type of Japanese cake. 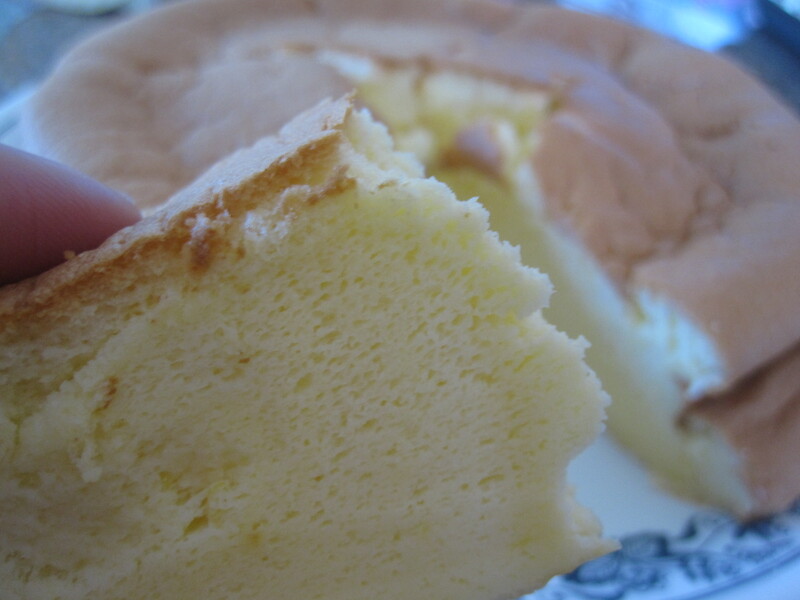 I looked at all Ogura cake photos and they all have that moist, cotton-soft, fine texture that I always want for cake base, be it a sponge cake or cake roll. 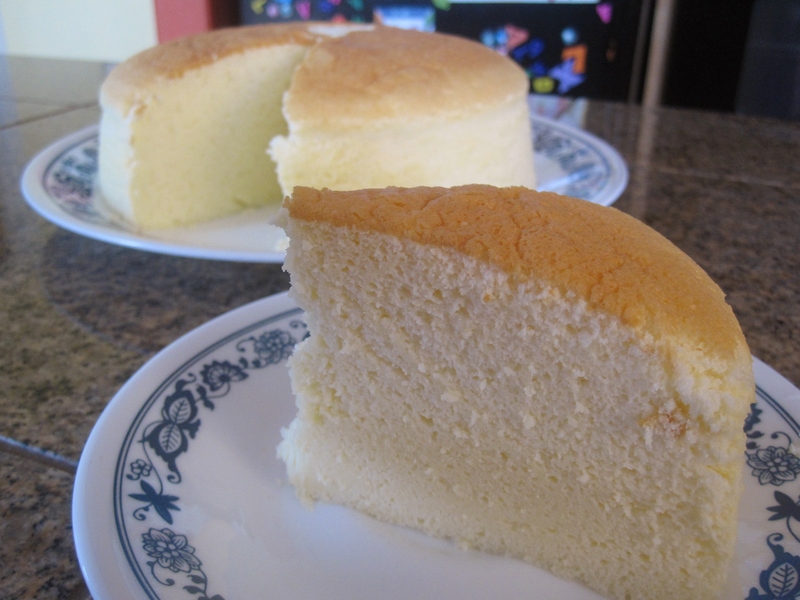 I have made sponge cake before but it didn’t turn out well enough for me– too dry, too dense and too rough (texture). I love chiffon cakes with all my heart– they are soft, moist, light and airy, but they don’t have that fine texture of a cake. Needless to say, I rolled up my sleeves and started my concur on Ogura cake– let’s start the Ogura journey with the chocolate version. End result? 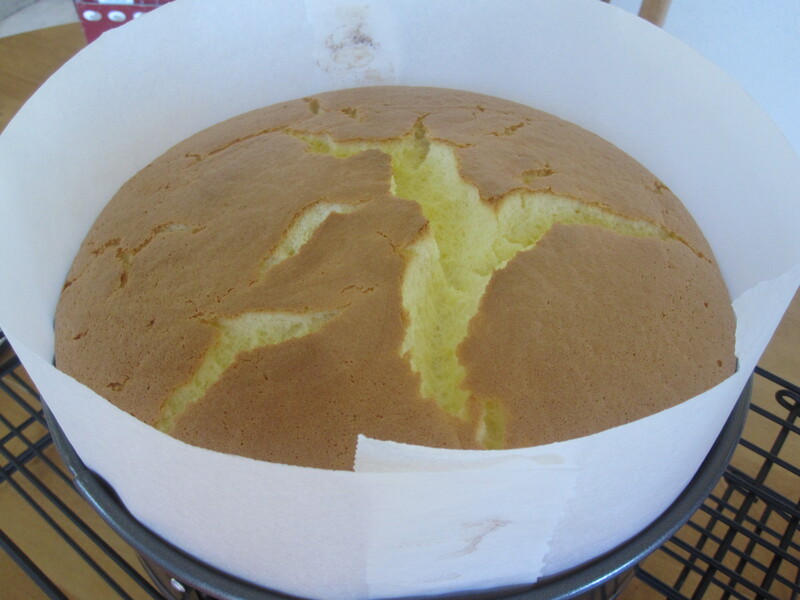 Just like some people said– it’s a cross between chiffon cake and egg-separated sponge cake. It’s moist, soft and the texture is more fine. 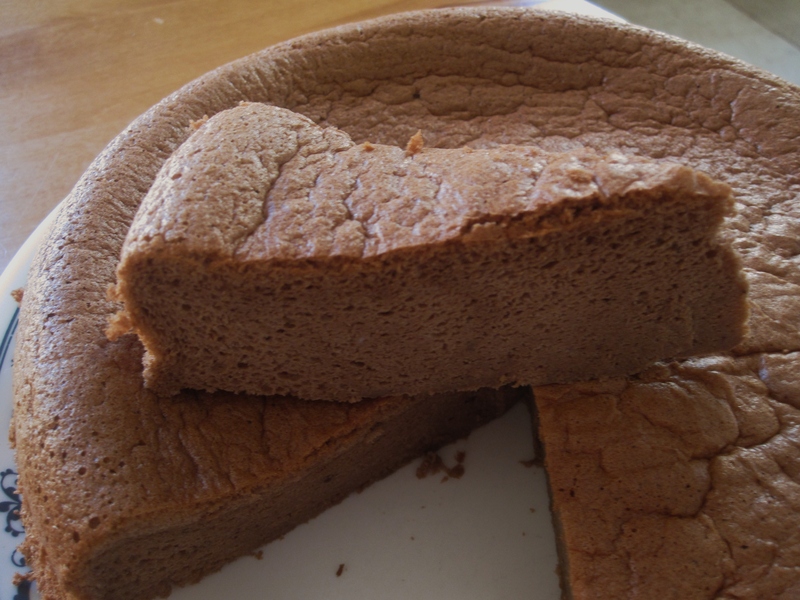 While chiffon cake is very light, airy and sometimes a tiny bit dry, Ogura cake is moist, soft and more fine which kinda melt in your mouth, just like Japanese cotton-soft cheesecake– except it’s a chocolate cake. I read about some people complaining about the cake being too wet, I didn’t have this problem this time, and I wonder is it because my baking method is slightly different– I put the cake on a rack, with water tray on the rack below (steam bake method), rather than had the cake pan sitting in the water tray (water bath method)? The top crust of the cake (my favorite part of a cake!) browned very nice and doesn’t get sticky even after cooling (Yay!!). Flavor: full of chocolate goodness and not very sweet, fit our palates just right. Preheat oven to 325°. Fill a shallow tray with tap water to half way and place the tray on the bottom rack. Place another rack on top of it– this rack is for the cake (so it is positioned at lower half of oven). Grease and line the bottom of a 9-inch cake pan. Place chocolate chips and milk in a big bowl over a double boiler, until the chocolate melts. Remove from heat. Use a balloon whisk to whisk in salt and oil until well blended. Cool slightly. Whisk in egg yolks and whole egg, one at a time, to the chocolate mixture. Mix well after each addition. Combine cake flour and cocoa powder. Sift flour mixture into yolk mixture in 3-4 batches, whisk to blend really well after each addition. Cover the bowl until egg whites are ready to fold in. Whip egg whites on high speed (KitchenAid speed 8) until bubbles are small and no clear egg white is visible. Add in cream of tartar, continue whipping on high speed (KitchenAid speed 8). Scrap the bowl if necessary. When the egg whites does not have visible tiny bubbles and turns white, gradually add in sugar. Continue on high speed (KitchenAid speed 8), scrap down the bowl. When the meringue looks glossy, reduce speed to medium low (KitchenAid speed 6 or even 4– this is to push out big air bubbles, producing a cake with tiny holes and thus a more fine texture). Whip until it is soft peak (soft curl tip on the whisk when lifted upside down). With a silicone spatula, gently fold in whipped egg whites to the yolk mixture in 3-4 batches, be sure there’s no egg white lumps in the batter. Pour the batter into cake pan slowly (this will avoid big air bubbles and last check for any egg white lump in the batter). Tap cake pan once. Bake for 50 minutes. Remove from the oven and inverted on a cooling rack until completely cooled. This recipe is from Diana’s Desserts, which is very popular over internet. Many recipe bloggers use or adapt from this recipe and said that the cheesecake is really light and soft. Long ago, I tried this recipe and it turned out to be a disaster– the top half of the cheesecake had a fine cake crumb but the bottom half was wet and dense like bread pudding. I was discouraged… until recently I saw people posting beautiful Japanese cheesecake photos on their blog, and I decided to give it a try. As you can tell from the picture, the cheesecake was still quite tall and handsome (I believe it’s because of the large amount of eggs used) even after cooling and shrinking. I personally would like the cake browned a bit more to a beautiful golden brown with smooth top crust, not the wrinkly crust after cooling!–> maybe increase oven temperature to 350°F during last 10 minutes of baking? After cooling, the cake surface sticks upon contact with cling wrap, finger… turning the cake quite ugly with patches missing everywhere. Why?? Could it be oven temperature too low/ too much steam/ not baked through?? I used low fat cream cheese so the cake didn’t have much of cream cheese taste to it. Very very light lemon flavor too–> will increase amount of lemon juice and add grated lemon zest next time. This time the cheesecake has the fine cake crumb texture. It’s moist but not wet like bread pudding. It’s very similar to my souffle cheesecake. Preheat oven to 325°F. Boil a pot of water. Prepare a shallow pan (I used my meat roasting pan). Grease and line the bottom and sides of a 8-inch round cake pan with parchment paper, leaving 2 inches above the rim. Melt cream cheese, butter and milk over a double boiler. Cool the mixture. Sift in the flour and the cornstarch, mix well. Add egg yolks, lemon juice and mix well again. Whip egg whites with cream of tartar until foamy. Add in the sugar and whip until soft peaks form (curly tip on the whisk when lifted upside down). Gently fold in whipped egg whites to the yolk mixture in 3-4 batches, until well blended. Pour into the cake pan. Tap on the surface once. Put the shallow pan/roasting pan at the lowest rack. Pour in boiling water carefully. Then carefully place the cake pan inside the water pan. Reduce temperature to 300°F. Bake cheesecake in a water bath for 1 hour 10 minutes or until set and golden brown. After baking, turn off oven and continue let the cake sit in the oven for 30 minutes with oven door ajar open. Remove from cake pan and continue cooling on a rack. Chill completely before serving. Baking method: Water bath vs. steam bake–> I wonder if steam bake method will make the cake more dry and produce fine care crumb rather than wet pudding-like texture. Cooling in the oven: Maybe removing water pan and take away extra steam will make the cake surface less sticky? Oven Temperature: I used 300°F but original recipe uses 325°F. Could this make my cake look pale browned and sticky because not baked through? Cream cheese: Should use full fat original version for a full flavor. Lemon juice: Should increase to 2 tbsp next time for more lemon flavor, add lemon zest too. My neighbor Auntie Wang gave me this recipe, and it turns out to be my favorite recipe for oil dough/water dough pastry because the dough is very soft and so easy to work with. I don’t know about you, but I always have problem rolling up the dough (after oil dough was wrapped in water dough), and also hates it when I put in fillings and try to pinch to seal tight– many times the dough just keep shrinking back, and the edges keep opening up… argh!! frustrations!! With this recipe, I NEVER have the dough problem. Because the water dough was so soft, it was so easy to work on on every step– wrapping oil dough, rolling, sealing the edges tight. It really helps making this long pastry process a lot less painful, especially if you are making 2-3 dozens pastries at one time. Another I like about this recipe: it uses cooking oil which is much healthier than shortening or lard. Prepare oil dough: Mix cake flour and oil in a bowl to form a dough (do not knead), until the dough doesn’t stick to the bowl. Wrap it up with a plastic wrap and set aside. Use the same to prepare water dough. Prepare water dough: Mix water and oil to blend well. Combine flour, sugar and salt in the bowl. Gradually pour in water/oil mixture to the flour. Use fingers to combine to form a dough, until the dough doesn’t stick to the bowl. The dough will be very soft. Add more water/oil mixture (equal part in each) or flour if necessary. Transfer dough to a flat surface, knead for a couple of times (do not over knead). Divide oil dough into 12 pieces, and water dough into 12 pieces as well. Roll each piece into a ball. Take a piece of water dough, flatten with your palm. Wrap in a piece of oil dough (avoid air pocket between two pieces of dough). Pinch to seal tight. With the sealed side facing up, flatten the dough with your palm again. Use a rolling pin, roll the dough out (away from your body) to a thin long oval shape. Then roll it up like a jelly roll using your fingers (the dough will be “laying on the side”, looks like ” = “). Turn the dough 90 degree (the dough will be in “standing” position, looks like ” || “). With the end side facing up, roll it out to a thin long oval shape then roll up like a jelly roll again. 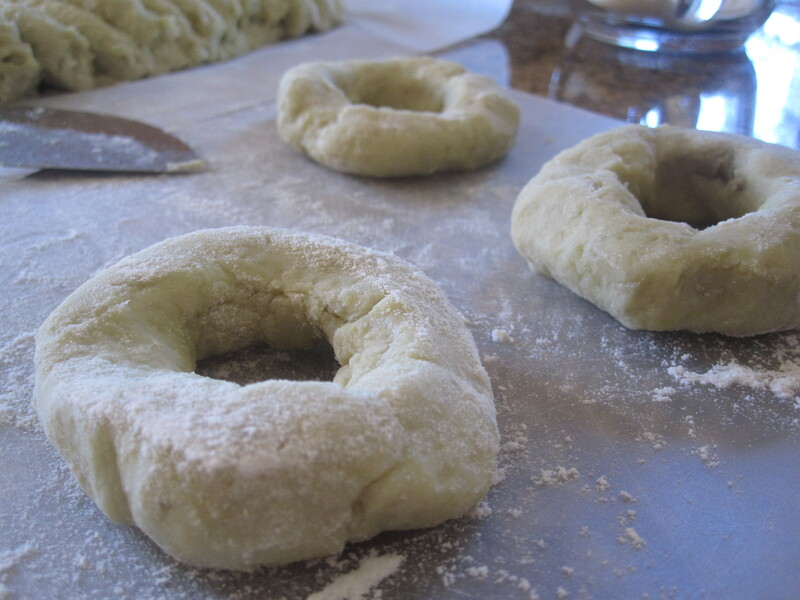 Repeat this process with the remaining water dough and oil dough. Take a piece of dough, make a cut in the middle on the long side of the dough. With the cut side facing up, flatten each piece with you palm, then roll out to a thin circle, for a total of 24 thin pieces of dough. Be sure the dough center is thicker than the edges. Flip the dough over (so the cut side faces down– this will be the outside of the pastry), scoop in 2 heap tablespoons of shredded daikon filling. Pleat (or pinch) and then twist tightly to seal the edge. Slightly shape into a ball or oval. You should see the thin layering on the surface. Repeat with the remaining dough and filling. Place pastry on a baking pan lined with parchment paper (sealed side facing down), bake at preheated 375°F oven for 30 minutes or until light golden brown. Cool on rack. Alternatively, unbaked pastries can be kept frozen. When it’s ready to bake, defrost pastries 30 minutes or 1 hour before baking. Adjust baking time accordingly (after 30 minutes, check every 10 minutes for golden color). It’s okay if the pastries appear wet while defrosting, it will dry out during baking. In a big bowl, rub in some salt (about 1-2 tbsp) to daikon. Set aside to let it soften and for the liquid to draw out. Then squeeze out as much liquid as possible. Set aside. Heat up 2 tbsp of oil in a wok on high heat. Saute garlic and dried shrimps until aromatic. Add in daikon and cook until the flavor comes out. Add seasoning to taste (adjust amount of salt accordingly as daikon tastes slightly salty already). Continue cooking until shredded daikon shrinks and look dry. Guideline for buying daikon: About 6 lbs fresh daikon yields fillings for 20-24 pieces pastries. Buy daikon when it’s in season to avoid bitter daikon or old daikon that is hollow in the center. Always choose daikon that feels heavy when you hold it in your hand. Daikon fillings can be prepared ahead of time, and it should taste slightly peppery and hint of sweetness. I sometimes add in some home made XO sauce for a spicy version. 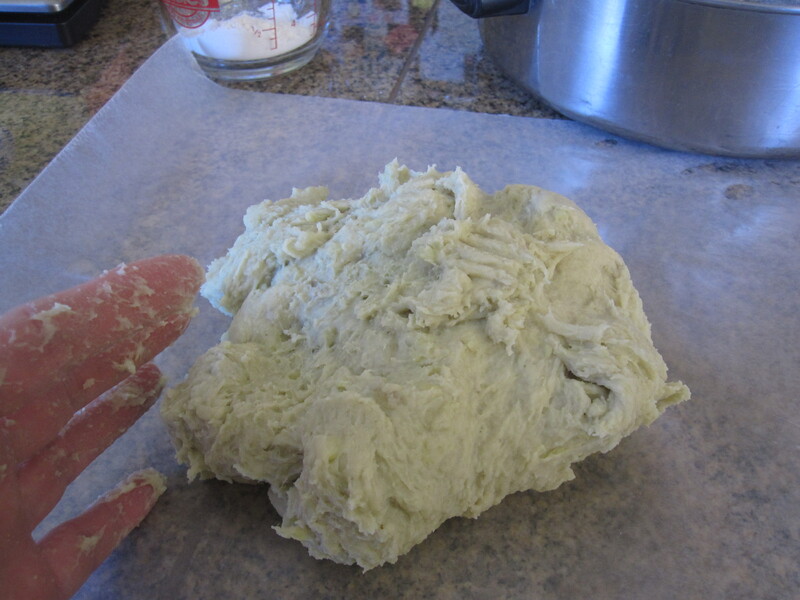 When wrapping oil dough into water dough, take care not to trap in any air pockets. Otherwise you might have problem when rolling out and rolling up the dough, as the air might poke through the dough and cause oil dough to leak out. Unbaked pastries can be made and kept frozen. Defrost unbaked pastries in room temperature for 30 minutes– 1 hour, depending on temperature. Adjust baking time accordingly (30 minutes, then check every 10 minutes until pastries turn light golden brown). It’s okay if the pastries appear wet while defrosting, it will dry out during baking. DO NOT apply egg wash– it will seal the layers! 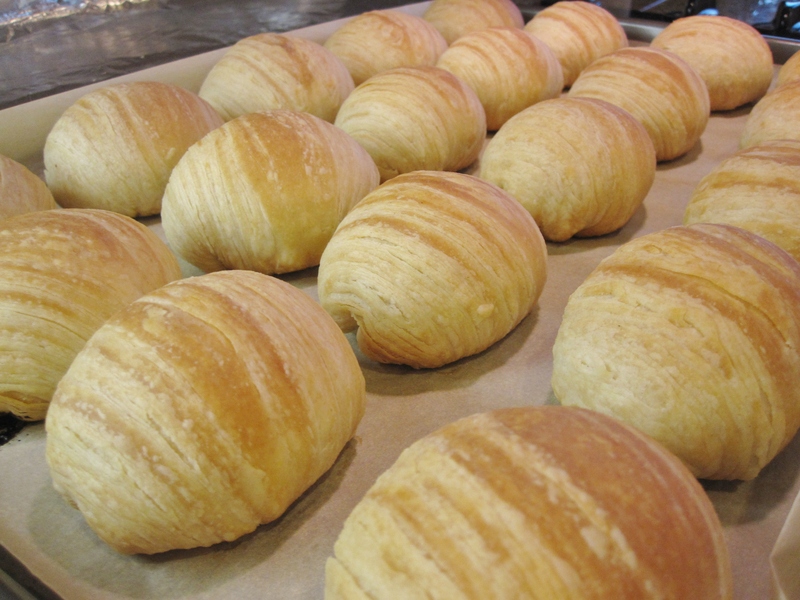 Making stripped pastry dough: wrap in oil dough into water dough. 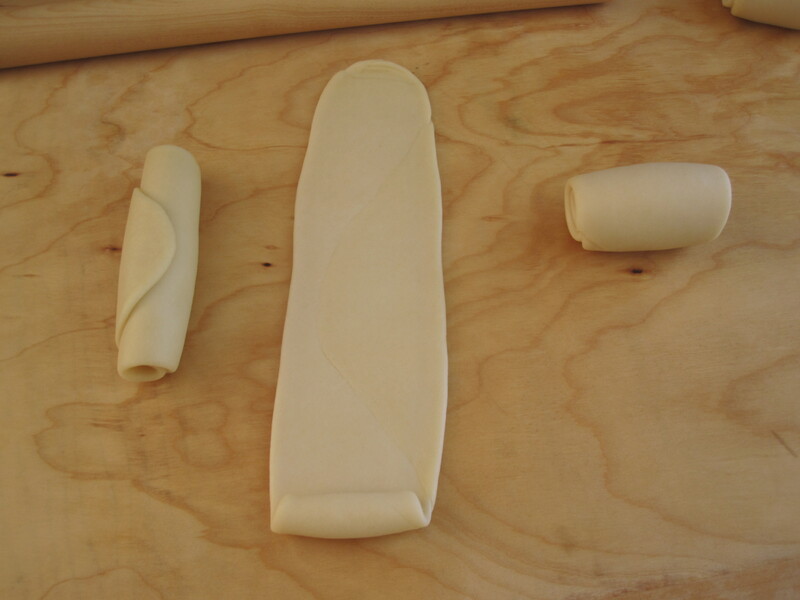 Steps for making stripped pastry dough (from left to right)– (1) wrap oil dough into water dough, pinch to seal tight. (2) flatten dough with hand. (3) roll the dough out to a thin long oval shape. (4) roll it up like a jelly roll. 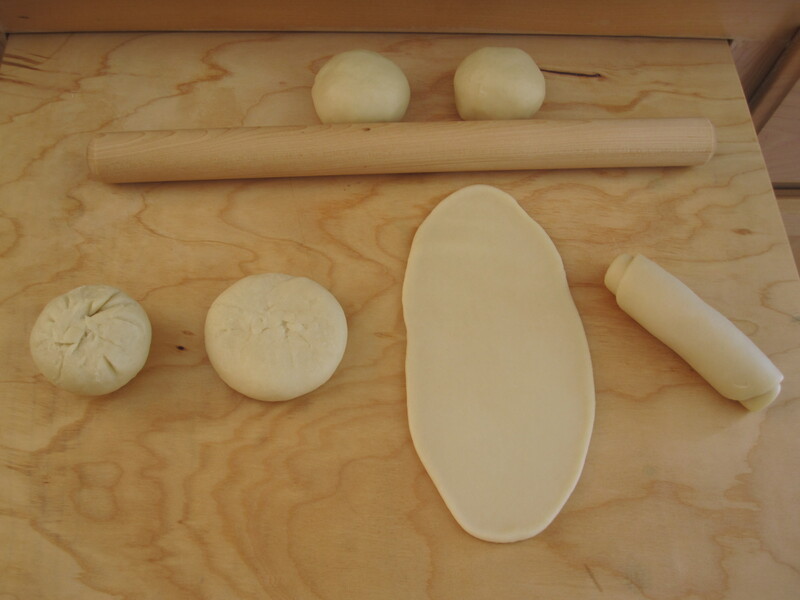 Steps for making stripped pastry dough (left to right)– (5) turn the dough to a “standing” position. (6) roll it out to a thin long oval shape again. (7) roll it up like a jelly roll again. 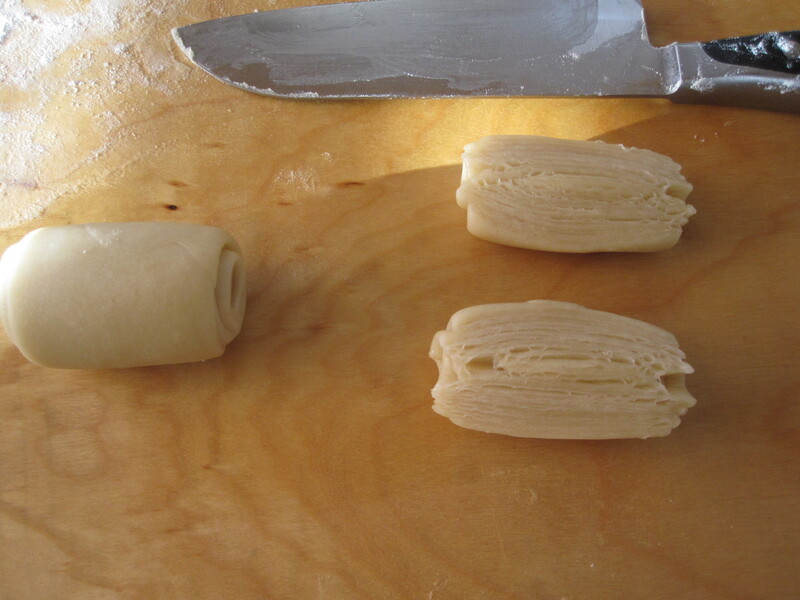 Making stripped pastry dough: (8)make a cut in the middle on the long side of the dough. Then flatten with hand, roll out to a disk or oval shape with center thicker than the edges. This is one of the easily found local breakfast food selling at the Malay street vendors or coffee shops. It is pretty much doughnut made of sweet potato dough coated with crystallized sugar. Because it doesn’t use yeast like American donuts, kuih keria takes a lot less time to make, and it doesn’t taste awfully sweet like American donuts. When I was a kid, these donuts, along with assorted curry puffs and other kuih-muih (assorted Malay cakes), were selling RM0.10 each (about 3 US pennies). Just 1 US dollars will filled your tummy with all kinds of hand made local cakes, be it sweet or savory. Back to kuih keria, it’s very easy to make, with very few ingredients and steps. One thing though about choosing sweet potato: I prefer yellow-flesh Japanese yam– the flesh is drier and has more flavor. 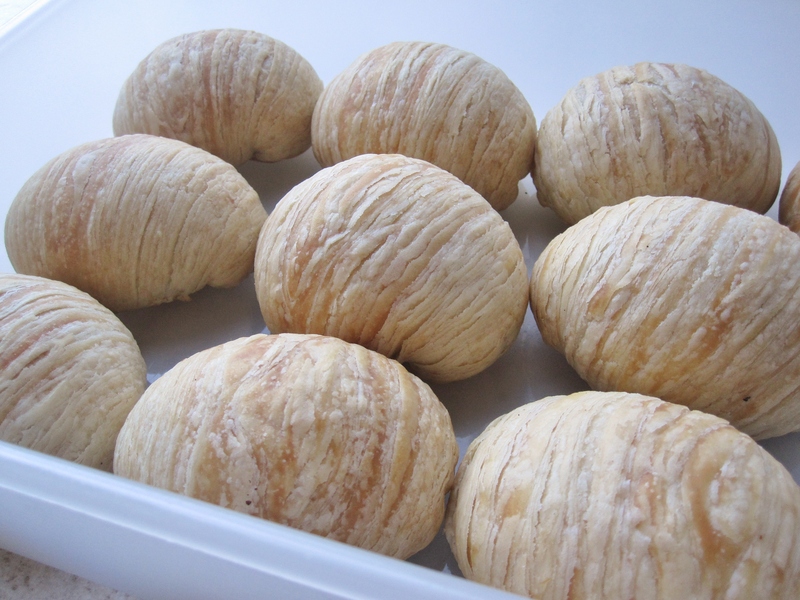 Avoid using the orange-flesh yam because its flesh has more moisture and mushy, requires more flour in making which could make kuih keria taste hard on the texture. Wash and steam sweet potatoes, skin on, on high heat until cooked and the flesh turns just soft. Peel of skins easily with hands and mash. Add flour to mashed sweet potatoes, mix and knead to form a dough. The dough should be slightly sticky. Add a little more flour if the dough is too soft or wet (but not too much as it will make kuih keria hard). Roll the dough to a log on a floured surface. 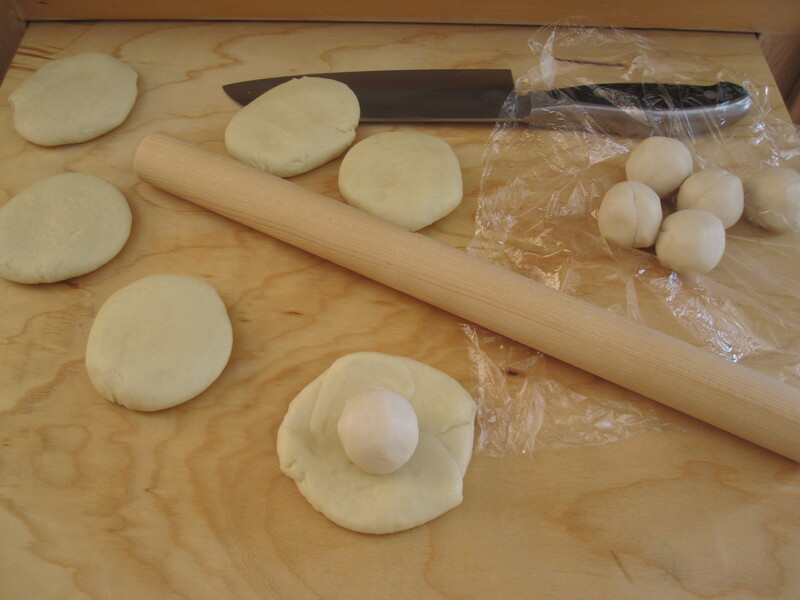 Cut into small pieces and roughly roll into balls (golf ball size), make a hole in the center with a finger (flour hand and finger to avoid dough from sticking). Set kuih keria aside on a lightly floured surface. Heat up oil in a wok or deep sauce pan until very hot. Carefully drop kuih keria into oil and fry for a few minutes until golden browned, flipping kuih keria half way for even browning. Do not overcrowd the wok/pan with too much kuih keria at a time. Drain on paper towels. Put sugar and water in a sauce pan, cook on medium heat until sugar becomes clear syrup and thick. Add fried kuih keria and keep stirring until all are well coated and eventually crystallized. 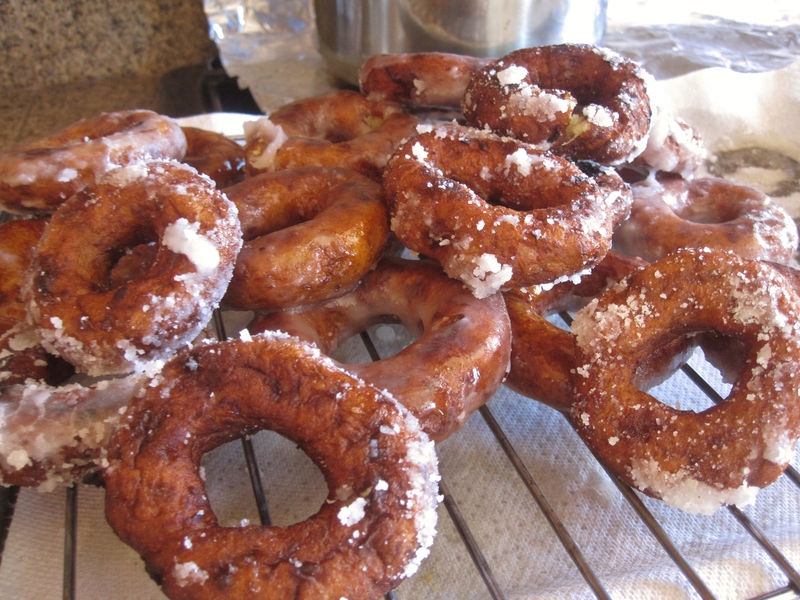 Malaysian Sweet Potato Doughnuts ‘Kuih Keria’– the dough should be slightly sticky. 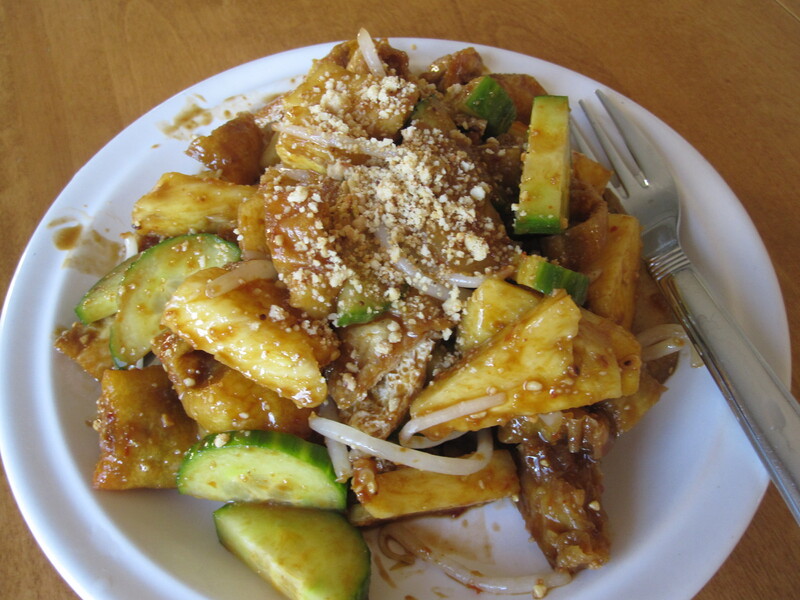 “Rojak” is a Malaysian style salad mixed with a special sauce that made with shrimp paste and among other stuff. The ingredients for the salad itself are usually a combination of sliced fruits and vegetables. 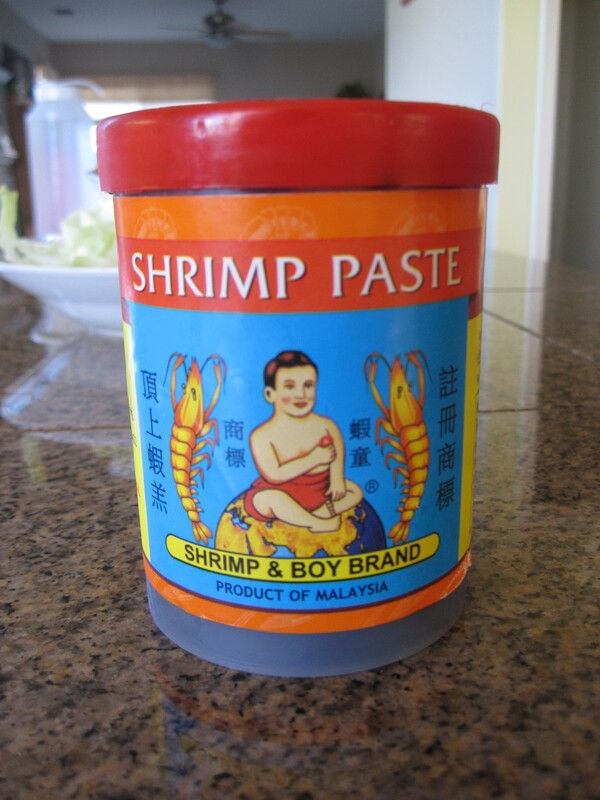 Because of added shrimp paste in the rojak sauce, some people may find rojak stinky and fishy, while others like myself think it’s delicious and addicting! Toss all ingredients (except peanut sprinkles) in rojak sauce to coat well. Sprinkle ground peanuts and serve immediately.